Volkswagen is offering its Golf S 1.4 TSI 125 PS 6-speed manual 3 door on a 48 month Personal Contrac Purchase for £199 a month after a £4,452 initial payment. 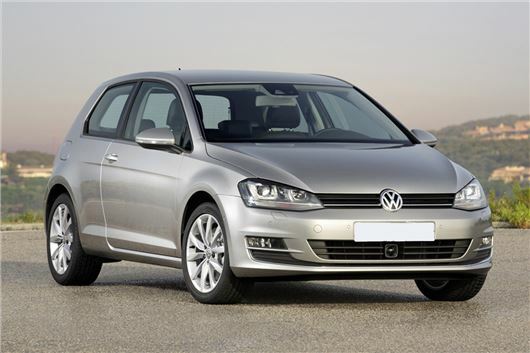 For the Golf Match Edition 2.0 TDI 150 PS 6-speed manual 3 door the initial payment is £6,368. For the Golf GT Edition 1.6 TDI 150 PS 6-speed manual 3 door the initial payment is £6,723. For the Golf R-Line Edition 2.0 TDI 150 PS 6-speed manual 3 door the initial payment is £8,409. At the end of the agreement, the vehicle and ownership rights will stay with Volkswagen Financial Services. Excess mileage charges apply. Further charges may be payable when vehicle is returned, subject to the contract fair wear and tear guidelines and mileage. Alternatively, on the Solutions Personal Contract Plan, VW will fund a deposit contribution of up to £2,000 at 5.4 per cent APR representative for private customers who finance a new Golf via Volkswagen Financial Services (VWFS). One size down, the Volkswagen Polo is now available from £139 per month via Retail Personal Contract Hire over 48 months. Or, on the Solutions Personal Contract Plan, a deposit contribution of up to £1,400 at 6.7 per cent APR representative is available on all new Polos. The extensive Polo range starts from just £11,525 (RRP OTR) and has recently grown with the addition of the stylish new Polo Beats trim, which brings unique styling, enhanced equipment and a class-leading sound system to the hatchback line-up. Among the Polo Beats’ highlights are an exceptional 300-watt seven speaker sound system develop by Californian audio experts Beats Audio, 16-inch alloy wheels and Beats Audio-themed styling details both inside and out. The Polo Beats starts from £13,910 (RRP OTR). For more details on all these offers and the cars in the Volkswagen range – together with brochures and pricing – and to use Volkswagen’s online configurator, please visitwww.volkswagen.co.uk. Personal Contract Hire – Terms and conditions: at the end of the agreement the vehicle and ownership rights will stay with Volkswagen Financial Services. Prices inclusive of VAT for private customers only. Offer available for vehicles ordered by 30 September 2016 from participating retailers. Excess mileage charges apply. Offers may be varied or withdrawn at any time. Further charges may be payable when vehicle is returned, subject to the contract fair wear and tear guidelines and mileage. Finance subject to status. 18 and over. Subject to availability. Terms and conditions apply. Accurate at time of publication. Freepost Volkswagen Financial Services. Solutions Personal Contract Plan – Terms and conditions: at the end of the agreement there are three options: i) own the vehicle: pay the optional final payment; ii) return the vehicle: subject to fair wear and tear, charges may apply; or iii) replace: part exchange the vehicle. Available on Solutions Personal Contract Plan. 18s and over. Subject to availability. Finance subject to status. Terms and conditions apply. Excess mileage charges apply. Offer available when ordered by 30 September 2016 from participating retailers. Offers are not available in conjunction with any other offer and may be varied or withdrawn at any time. Accurate at time of publication. Freepost Volkswagen Financial Services. One year’s insurance included at no extra cost from Volkswagen Insurance is available on all qualifying new Polo models only ordered from 1 July 2016 to 30 September 2016 and registered by 10 January 2017 for drivers 18 and over (BlueGT and GTI is 25 and over). Drivers under 18 are not eligible. Excludes Northern Ireland. Drivers aged 18-24 are required to share their driving style data with a telematics product. Other eligibility criteria apply. Go to www.insurewithvolkswagen.co.uk/polo for full terms and conditions. This offer may be extended, changed or removed at any point. Volkswagen Motor Insurance from Volkswagen Financial Services is arranged and administered by Carrot Risk Technologies Limited. PCP and Solutions offers exclude the e-Golf, Golf GTE, Golf R, GTI Clubsport S and GTI Clubsport Edition 40 models. Initial payments vary by model. As an example, the initial payment on the Golf S 1.4 TSI 125 PS 6-speed manual 3 door is £4,452.